Before Shri Mataji started Sahaja Meditation in 1970, getting Self-realization was very difficult. It was done on a one-on-one basis. Our chakras could only be cleansed through many austerities over many years and Kundalini was awakened only after the cleansing process was complete. Today with Sahaja Meditation, Self-realization is possible en masse. The vibrations are perceived by the Mooladhara chakra, which informs the Kundalini, waking her from her dormant state. 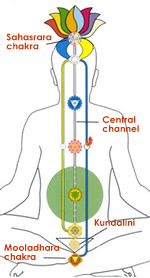 The Kundalini rises through the central channel in the spine. When she reaches the fontanelle bone at the top of the head, the Sahasrara chakra, the Kundalini achieves the connection with the all-pervading power of the Divine. The kundalini can be felt as a cool breeze in the palms of the hands or on top of the head. The Kundalini nourishes our chakras which are out of balance and corrects them. When the chakras are clear enough for the Kundalini to rise without obstacles, we can feel the peace and enjoy thoughtless awareness. The Kundalini can be understood as consisting of many strands of energy. The more we meditate, the more strands can reach our Sahasrara, and the stronger our central channel becomes. This helps us to live more in the present. I have read all the information listed above, but I have some questions! Please check the support forum first. You can either post a question on the forum or send it to us through the contact form. I am doing OK, I want to go to the next part! Please click here to go to the Guided Meditations.